Nonetheless, I wasn’t too concerned at the time. After watching Brady march down the field and score come crunch time, I was quite confident we’d somehow manage to edge out a victory. Maybe it’s because we’ve been so spoiled over the past decade but I just wasn’t concerned that there was a possibility we’d lose. After the Cards got a first down on their next possession, the realization that we were going to lose slowly set in. I began to accept it at that point. I thought maybe we’d have enough time to at least get into field goal range but it didn’t look good. Then the unthinkable happened. Ryan Williams coughed up the ball with a certain victory dependent on merely running the clock down. That’s day one stuff. DO NOT FUMBLE. Not only were they putting the ball in Brady’s hand with more time than originally planned, but we were already in field goal range. Poor Ryan Williams looked as if he lost a winning Mega Millions ticket and accidentally ran over a puppy on the way to the field. (Too graphic? )Anyways, I knew it. Somehow, someway the football gods were not going to let us lose to the Cardinals. Fast forward a few minutes…and of course we all know how that played out. Absolute shock/speechlessness throughout New England, followed by an immediate hatred for Gostkowski. Was there a ton of pressure on him? Of course. Should he have made the kick? Of course, especially after splitting the uprights with ease from 53 yards earlier in the game. 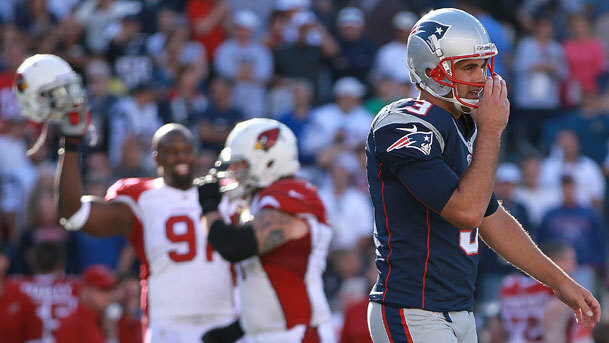 No matter which way you look at it, Stephen Gostkowski will be the scapegoat for losing this game even though he shouldn’t be. Not only did we play awful in general throughout the game, we made mistakes down the stretch. In particular, Gronk had two huge penalties that brought back the potential game winning touchdown as well as put us back a few yards. In essence, we didn’t deserve to win. As depressing as yesterday was for Patriot Nation, I will attempt to be somewhat optimistic about this situation. At least this happened now and not come playoffs. We got it out of our system. The Pats even admitted to having a rough week of practice prior. Things just weren’t going the right way from the start. Obviously not ideal, but hopefully it’ll be an eye opener for the rest of the season. Hopefully. Update: It looks like Hernandez will be out until at least October. Losing the Gronk/Hernandez TE duo is obviously a blow to our offense, not to mention the questions surrounding Welkers contributions. With Hernandez out, who do you think will fill the void moving forward? Welker or Edelman? This entry was posted in Patriots and tagged Arizona Cardinals, boston sports blog, fumble, Gillete Stadium, new england patriots, nfl, rob gronkowski, Ryan Williams, Stephen Gostkowski, tom brady by jtulz07. Bookmark the permalink.